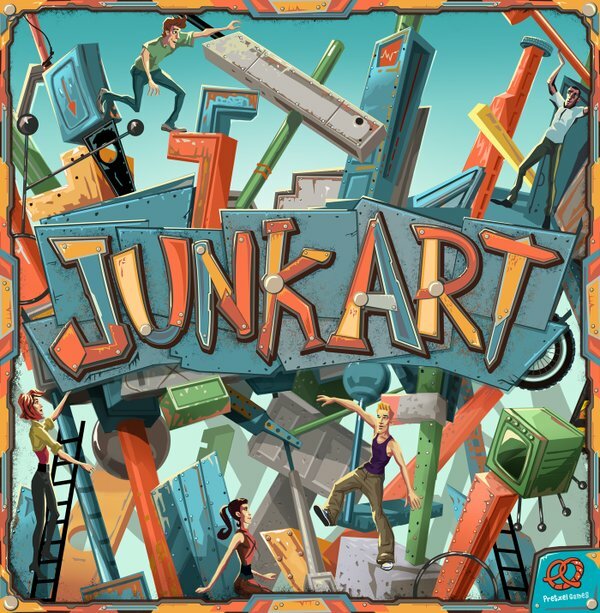 Junk Art contains more than ten game modes, along with more than sixty big colourful wooden or plastic components. In one version of the game, players pile all of the wooden or plastic parts in the centre of the table, then are dealt a number of cards, with each card depicting one of these parts. On a turn, a player presents their left-hand neighbour with two cards from their hand. This neighbour takes one card in hand, then takes the part shown on the other card and places it on their base or on other parts that they’ve already placed. If something falls, it stays on the table and the player continues to build on whatever still stands. Once players have finished playing cards, whoever has the tallest work of art wins.